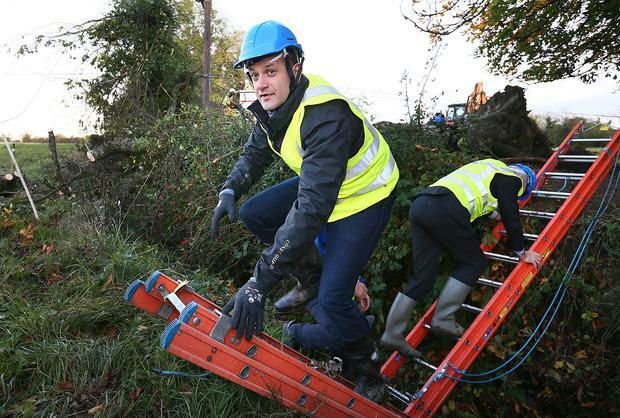 Taoiseach Leo Varadkar waded through the mud of a Co Meath field to thank ESB Networks crews for restoring electricity to blacked-out communities. Speaking to reporters at a muddy gateway, he paid tribute to the huge nationwide repair operation under way in the wake of Ophelia. "More than half of people who lost power have had their power restored. The vast majority of people will have power restored in the next three to four days." "I think it is something that merits consideration, but I'd never rush into creating a new crime," he said. Regarding the repairs, he said some 400,000 homes lost power supplies and more than half of those were restored. Ireland did not suffer sufficiently to qualify for special EU funds for repairs.